I would like to begin by thanking AdventureCORPS for putting on a well organized and safe event. The AdventureCORPS volunteers are amazing and I wish to thank them for working so hard and sacrificing their riding so that I may ride my bike. Global Star for the SPOT transmitter and the excellent support I have been receiving from Brad. Swiftwick socks for the best socks to don over your feet as you ride hundreds and hundreds of miles in them. SRM for the 7900 wireless ANT + crankset power meter, an invaluable tool for proper pacing during Ultra racing. Last but not least Infinit Nutrition for fueling me. I should note that on this fully supported event I used Hammer Nutrition, after my initial two bottles. I arrived in Death Valley approximately 730pm Friday night. My goal was to be in DV much sooner but there was an accident on Hwy 15 where I literally moved only four miles in one hour!! I volunteered for about an hour at rider check-in. I enjoy being at registration because I meet many riders that I may never see on the course. In particular, the riders doing their first century. I can’t imagine a better place to ride your first century. Additionally, I meet riders who have been reading my blog and I’m able to have a normal and calm conversation with them instead of yelling “WHAT?” , “HUH?” , “Oh yeah!” while on the bike. One such rider that I met on Friday was Deke who has been reading my blog from his home in Iowa. We spoke for a while about challenging cycling events such as Trans Iowa (race report) and life in general. He and his partner own and operate a logistics company. He is also a family man. We talked about the balancing acting of all those moving parts. Deke, thank you for reading my blog. I hope I continue to provide inspiration for you just as much as I have received from you. From the outset I would like to make a clarification that this is a ride report not a race report. I didn’t race this event. I rode conservatively with a few hard surges but didn’t attempt to contend with the riders who showed up. 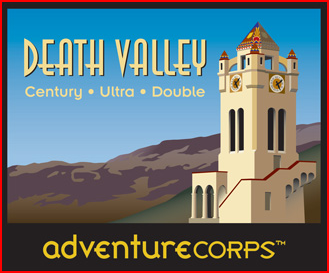 I completed the AdventureCORPS Fall Death Valley Ultra Century (144 miles) with one extra climb and a few extra miles for good measure. My ride was 157 miles. The only section I cut out of the Double Century route was the flat section from the Nevada state line to Hwy 95 turn-around. Just before the start I met Rich (please forgive me if I don’t get the names right throughout this post) who said he had been reading my blog and found it inspirational. He said he had read my latest post about all the things that happened to me in the 2012 training season. Rich said he could appreciate the struggles I faced at the end of my season. He was glad to see me out riding the event. There is no way he could have known this but just that short conversation lifted my spirits immeasurably! 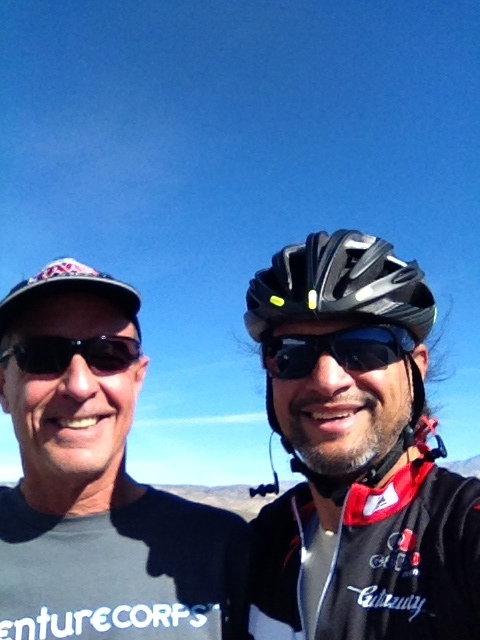 Rich and George “Red Eyed Vireo” Vargas at the start of AdventureCORPS Death Valley Ultra Century. I then took a quick look around to see who was lined up in the first wave of 50 riders. I spotted a tandem. The tandem was being ridden by Craig Robertson and Lori Cherry. Craig and Lori are Furnace Creek 508 veterans. I knew this was the wheel I needed to be planted behind. 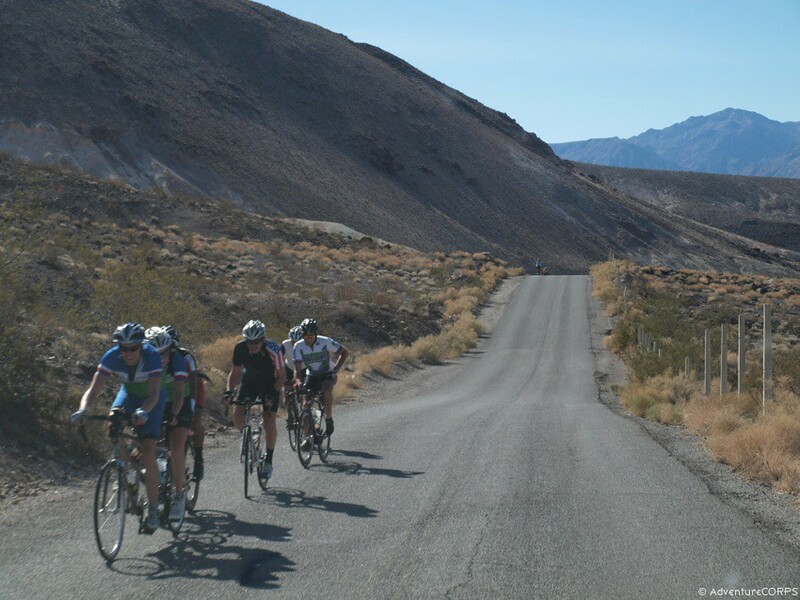 The tandem led the first wave of 50 riders for the entirety of the first leg from Furnace Creek to Stovepipe Wells. We moved along at a very good pace. I took full advantage of the draft being directly on their wheel the full 25 miles. We reached Stovepipe Wells with about 10 or 15 riders in tow. I rode very conservatively to Stovepipe Wells. In fact, I mentioned to my friend Daniel Eitman, that my average power was 142 watts (1.93 w/kg). Daniel and I patiently waited for the tandem to refill their bottles, and then we rolled out of Stovepipe Wells together, Daniel, the tandem and I. I felt great and hadn’t felt under pressure at all. So far I was having a very easy day. While Daniel and I were waiting for the tandem to refuel at Stovepipe Wells, several solo riders came in and out of the checkpoint hastily refueling and remounting on their bikes. I sat there and watched them and thought to myself that’s usually me coming in “hot”, refilling bottles, and back on the bike in fewer than two minutes. But today I just sat there calmly watching them. When they went up the road and disappeared out of sight I felt a huge relief. Power- (yellow) maintain below 220 watts– the two yellow lines show a range from 142 watts (actual) and 220 watts (ceiling). Intensity Factor- Notice the third item down in the summary section looks like this “TSS:42.1 (0.601)” the 0.601 translates to 60% of my Functional Threshold Power (FTP) which is 250 watts (275- 285 watts when in shape). FTP is the amount of power which a rider can hold for an hour. In layman’s terms all of this just means I was riding at 60% effort. Heart Rate- (red) below 165 Bpm – Actual 162 Bpm– I don’t usually pay attention to Heart Rate but I know that many of you are more familiar with Heart Rate than Power as a pacing measurement. Speed– Is not relevant. When riding with the lead group your speed is whatever it takes to stay within the break-away. There is no need to go any faster. At the 2011 Spring Death Valley Double Century I was fortune enough to execute a 150 mile solo break-away– a rare occurrence. 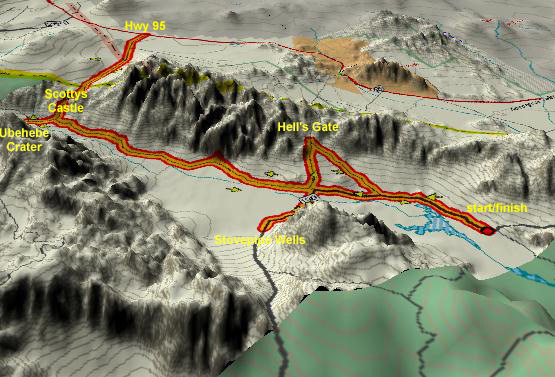 The next section is a long gradual climb of 50 miles taking you from sea level to 4300 feet at the Nevada state line. It was in this section that I saw an old friend and Furnace Creek 508 veteran, Michael “Red Racers” Sturgill. 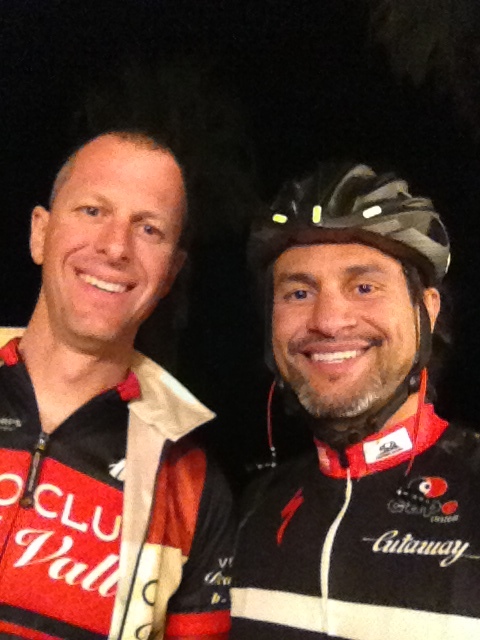 I hadn’t seen Michael in a few years because I haven’t been doing the brevet events lately. Brevets are unsupported long distance events. The last time I remember riding with him was while doing a 600km (385 mile) event (ride report here). He was so consistent. He was strong all day and even at night while I had my sleep issues. It was nice to see Michael and to be able to chat with him. I stayed on the tandem’s wheel all the way to Scotty’s Castle. They made a stop at Mile 53, a stop I don’t usually make when riding hard. Once again, I had to keep my competitive nature under control. I didn’t need anything so I just hung out and talked to the volunteers. Power- (yellow) below 220 watts– the lines 142 watts and 220 watts -156 watts actual (2.12 w/kg) vs 142 watts (1.93 w/kg) for the first 25 miles. My plan to ride conservatively and still make good time was working out just fine with the help of the tandem. As we exited Scotty’s Castle we began the last five miles to the Nevada state line. The road was closed to vehicular traffic but open to us. The pavement was in decent shape with lots of sand and gravel and only a few sections where the edges had given way. While going uphill it wasn’t much of a problem. You just had to pick a line and navigate through the sand and gravel. The tandem was doing a great job picking good lines and maintaining a steady pace up the climb. A few times I felt I was under pressure. I felt the fatigue on my legs of not being in proper form for an event of this length. The 50 miles of climbing with the gentle 2% grades were now pitching over 6% and starting to take their toll on me. I stayed with the tandem until the Nevada state line and then let off the power. You have to look really hard but I am tucked in right behind that tandem! Once I reached the top of the climb I didn’t feel so great. Funny how when under power you don’t feel so bad but then you back off of it and bam! it all hits you. I pulled over and sat underneath a chaparral bush (I think) and drank my two bottles of Perpetuem. I sat there for 25 minutes. I watched a few pacelines pass by. But mainly I was alone with my thoughts. Since the road was closed to cars the only interruption from this makeshift sanctuary was the occasional cyclist. I sat there wondering how I had let myself fall so far down from my early season form. I also pondered how I let myself gain 12 pounds on my 150 pound body. While 12 lbs may not seem much to some of you those 12 lbs almost represent 10% of my total body weight!! 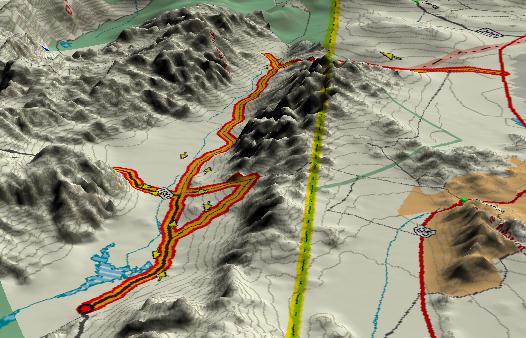 It was then decision time– do I go on or do I just go back down to Scotty’s Castle and recover even more before tackling the remainder of the course. The “flat” section from there to Hwy 95 and back didn’t appeal to me on that day. My decision became clearer to me the longer I sat there. Sitting in my little nook I took in the view and considered myself damn lucky to be in such a beautiful place. I took a panoramic picture but it does nothing to capture to the beauty I beheld. 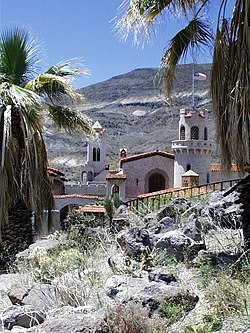 When I felt rested and refueled I got back on my bike and descended to Scotty’s Castle. On the descent I paid a little more attention and safely made it in to the checkpoint. Normally this five mile section is a fun descent because it has lots of twists and a good grade to keep your speed up in the corners. But today it was not important to “bomb” the descent. Lots of riders were giving me the thumbs up and looking surprised that I was heading back. I interpreted their looks of astonishment as “Wow he’s already on the return!” I felt horrible deceiving them. I feel that people have come to expect that kind of performance from me but…I’m human and I too have my bad days. Power- (yellow) below 220 watts– the lines 142 watts and 220 watts –172 watts (2.34 w/kg) for climb vs 156 watts (2.12 w/kg) to get here and the 142 watts (1.93 w/kg) for the first 25 miles. At Scotty’s Castle I had a Subway sandwich and a Dr. Pepper. My friend Rosalie was one of the volunteers at Scotty’s. I enjoyed an unhurried visit with her. We talked about her season. She informed me of her two crashes which resulted in two serious injuries, a broken elbow and a shoulder dislocation, respectively. In talking with her I realized that even though my season was not so great and I had some injuries they weren’t broken bones. Rosalie, I hope you heal quickly and get back on the bike! The next climb on the ultra century course was up to the Ubehebe Crater. Working the checkpoint was Patrick Seely. 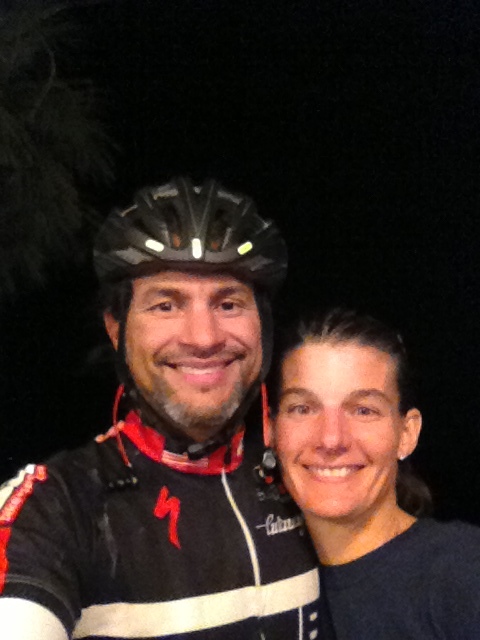 He was part of the tandem team Lionfish at the 2012 Furnace Creek 508. 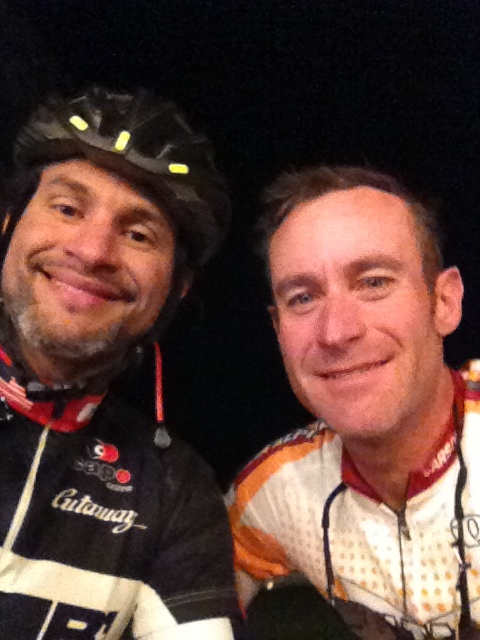 I hung out and visited with Patrick and spoke to him about my 2012 508, and 2007 RAAM experience. I learned from him that he was going solo RAAM in 2013. 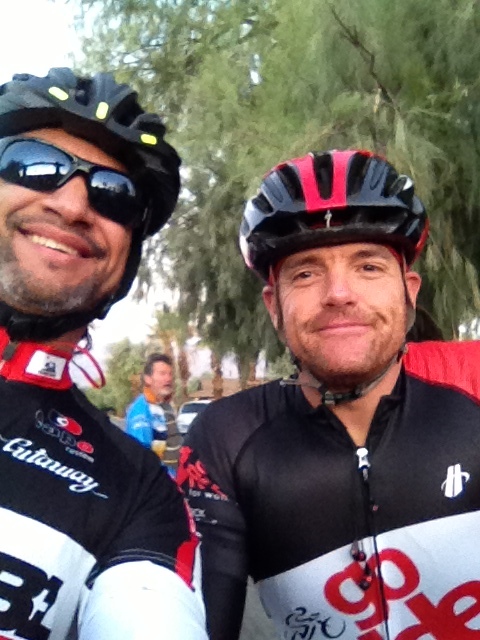 Let’s wish Patrick Seely luck on his RAAM experience!! Ubehebe Crater is a large volcanic crater 600 feet deep and half a mile across. 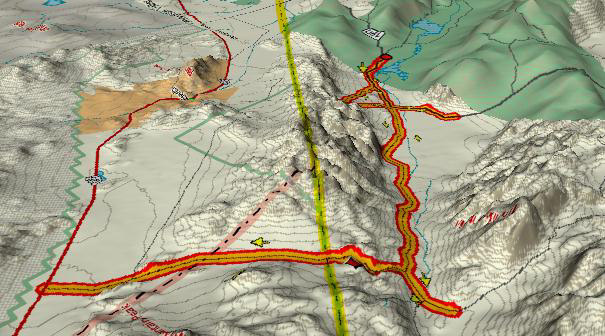 We often hear mistakenly that “Ubehebe” means “big basket”, but the Paiute name Ubehebe was first applied to the 5,678 ft. Ubehebe Peak, 24 miles southwest of the crater. How the name Ubehebe became associated with the crater is not known. To the Timbisha Shoshone Indians, the crater has been known as “Tem-pin-tta- Wo’sah”, meaning Coyote’s Basket. Although applying this translation to the word Ubehebe has produced a great deal of confusion, but comparing the crater to a basket is appropriate. I left the crater, feeling great and began the long gradual descent to Mud Canyon. Along the way, I ran into Bill Walton. Bill and I have seen and spoken to each other at several AdventureCORPS events and he even stopped at my shop one day. I rode with him for a little bit while asking him how he dealt with setbacks during his NBA career. His words were very uplifting. We agreed to meet when we were both back in San Diego to discuss this topic further. But during this short exchange he put the day in perspective. It was a beautiful day in a beautiful place and we were riding our bikes and what could be better than that? He was so right what could be better than this? Thank you Bill you did wonders for my spirit on Saturday. Some time passed and I enjoyed the solitude of riding in Death Valley. It is my escape from people, customers, family, freeway traffic and all the little annoyances that add up together to make for a stressful day. While I was alone I took even more time to reflect on my season. I thought about how everything was going to be different in 2013. How I was going to find time to train and come back with guns blazing!! For many miles I didn’t see any riders in front or behind me. It was great. Eventually a paceline of five riders caught me. I joined in the rotation with the five riders and we rode together to the Mud Canyon checkpoint. My favorite part of this course is the last climb of the day, Mud Canyon. When I do the Double Century it’s at mile 168 and it really hurts. What I like about it is if you have been riding foolishly during the day you will pay for those sins on the 6.5 mile climb. It offers one last challenge to the front runners to see who can maintain their position in the event. On Saturday it was only mile 130 for me but for the riders I joined up with it was mile 168 and it showed on them. Shortly after beginning the 6.5 mile climb the group of five splintered. I knew I was not in great shape to stay with them and I felt fine letting them go. I climbed on my own until I caught Reeve Ramos. He was the second rider to get dropped from the group. I saw how bad he was suffering and offered him my wheel Staying with him, motivating him, talking to him and maintaining steady cadence and power for him was helpful to me too. That worked for about 2 miles and then I started to hurt. By that time Ramos had recovered and even though I had turned around many times to ensure he was still on my wheel he just pulled away from me and literally never looked back. I felt it was a bit unsportsmanlike of him to drop me after I had paced him up during his rough patch. But I guess that’s just his style. After Ramos dropped me I really started to fall apart. My legs were so fatigued I couldn’t keep the same pace I had found comfortable earlier in the climb. I pulled over at mile marker 4. You should know I have never stopped on this climb. I stopped until my heart rate came all the way down below 110 Bpm. I resumed the climb but had to stop again at mile marker 5. I was just not having a good day. When I reached the summit of the climb I visited with Giant Water Bug and his lovely wife. I find it amazing how often I see them volunteering at AdventureCORPS events in Death Valley. Thank you Giant Water Bug for allowing me to ride my bike. The descent off of Hell’s Gate was much more fun than the climb up. It was also uneventful. Once back on the valley floor it was just 11 miles to the finish. I couldn’t be happier with the ideal weather conditions for this year’s Ultra Century. I had flashbacks of riding the same 11 mile section during the Hell’s Gate Hundred. 2012 Hell’s Gate Hundred was a windstorm but today the weather was perfect. According to my Garmin, the high was 84°F. There might have been a light wind earlier in the day but nothing to write home about. It was just a perfect day in Death Valley. At the finish I met a few more people who had been reading my blog. I had the good fortune to meet Stacy. She hadn’t done a century in 15 years and had just recently stumbled upon my blog. She said that I inspired her, because even with the tough season I had had I still went out and attempted the Furnace Creek 508. She confided in me that if I had the guts to go out and do the 508 then she could do this century. I’m paraphrasing but I believe the sentiment is accurate. She was surprised to see me at the event and seemed to be pleased that I “got back on the horse”. Below is a picture of Stacy and me. I’m sorry I wish I would have taken notes but above is another rider I spent some time chatting with at the finish. After sitting around the finish line for a couple of hours. I volunteered to ride with Chris Kostman, the race director. We were driving sweep to get a head count of how many riders were still on the course. We turned up Mud Canyon and immediately I saw a couple of riders struggling up the climb. As we got closer it was actually ONE rider suffering, Fernando, and the other rider was pacing him up. Fernando was moving slowly but still moving forward. We continued driving up the canyon and saw a few more riders. We counted two more riders who were walking. We also spoke to another rider who was rumored to have passed-out on the climb but seemed to be in good spirits now while seated in one of the SAG vehicles. Satisfied that we had a good headcount and that everyone seemed safe to continued up the climb we zoomed up to the top to check on Giant Water Bug and his wife. We kept them company while we evaluated every rider that came through to ensure they could safely navigate the chilling descent. One such rider to be evaluated was Bryan Flamig. He had had a couple of injuries leading up to this event and had not really been training. When he reached the top he was shaky and uncertain whether he should continue. I believe he made the right decision to end his ride in the warmth and safety of a SAG vehicle. We spoke a few minutes and he mentioned he read my blog from time to time. I had been collecting pictures all day and asked Bryan to take a picture with me. The picture below is from his blog. Oh My God look at the gut on me! I need to go on a diet STAT!! Bryan Flamig and I at the top of Hell’s Gate. The next morning I drove up to Dantes View and took a few panoramic pictures of Death Valley below from 5700 foot elevation. In a word- SPECTACULAR! What’s next for the Red Eyed Vireo? Winter base training, dieting and getting back in shape!! Stay tuned for training updates and 2013 Race Schedule. I hear there might be some new events available to test your endurance. I’ll let you know what they are as soon as the dates are published. This entry was posted in AdventureCorps, Death Valley by REV Cycling Directeur Sportif. Bookmark the permalink. Another excellent ride report. I’ve never done this double but it’s high on my bucket list. Hopefully next year. Flew out from the UK to ride the fall DV and found your blog very useful. You are right this is a well run event in a fabulous location. Broke a spoke and lost a shed load of time but finished!